Step 1. Firstly, the Booking Form should only be used if you are fully ready to commit to a booking. If after having looked through the site you have further questions please contact us via the ‘contact’ tool on the home page . Step 2. Check availability on the calendars shown at the bottom of this page, any dates in white are potentially available. Click the green Online Booking Form button below. Complete the form and submit by clicking send. Each driver will need to complete their own Booking Form. 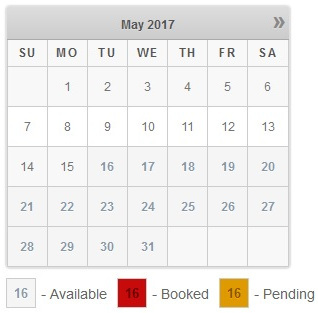 Remember that hire is by the day (not the night) so unless previously agreed your booking will comprise of one night less than the number of days you have booked for. Step 3. Once the Booking Form(s) have been received by us we will check the form and send an electronic invoice. The minimum payment will be 25% of the hire total and this is required to secure the dates requested. The remainder will be payable at the 6 week from hire point. The full amount of the hire is applicable if the booking is to occur within 6 weeks. Step 4. On receipt of payment you will receive a confirmation of your booking – please check it. The booking is now made. Note. It is highly likely that we will have multiple enquiries (and even multiple invoices issued for payment) for the same or overlapping dates so we operate a ‘first to pay’ priority. Please be aware of this because it may lead to your requested dates being booked by another party before you have committed by paying the deposit. If a situation like this occurs we’ll do our very best to accommodate you with an alternative. Smaller Campervan Hire? Click the calendar below.